What happens when you disappoint those you love, and you can't accept forgiveness? 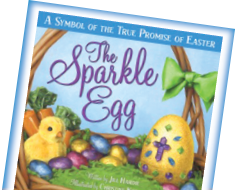 The Sparkle Egg, written by Jill Hardie and illustrated by Christine Kornacki, tells a timeless story of the struggle we all face when we disappoint the ones we love – and introduces a beautiful new tradition to help us accept God's grace: The Sparkle Egg. Join Sam, the beloved character of The Sparkle Box, as he discovers the gift of Easter through The Sparkle Egg. Readers of all ages will relate to the unshakable guilt Sam experiences when he chooses to lie to his parents to avoid disappointing them, and rejoice as he makes one final decision, to accept the gift of forgiveness offered through Jesus Christ. What readers are saying about The Sparkle Egg. "The Sparkle Egg is a refreshing and inspiring story about a young boy Sam who lies to his parents but receives the full forgiveness of God through Jesus His Son on Easter morning. The experience with The Sparkle Egg is something every parent will want to do with their children. This book penetrates the heart, and although it is a child's book, it touches readers of all ages and leads to transformation. The Sparkle Egg is treasure and a new Must Read." "While The Sparkle Box is a story that encourages us to give to Jesus by helping others, The Sparkle Egg is a story that encourages us to accept the gift of love and grace that Christ offers to us. Jill has a special gift for communicating a challenging and difficult message in a way that is simple and easy to understand. Everyone messes up and we all need God's forgiving love and grace! When we hold on to feelings of shame and guilt we can't fully be who God wants us to be. The message of The Sparkle Egg is one that adults and children of all ages can relate to and respond to as we seek to honor Jesus' sacrifice by accepting God's gift of forgiveness so we can let go of those burdens and shine for Jesus. We are planning to use The Sparkle Egg at a special event in our church in the hopes that families, adults and children of all ages will more fully experience the true promise of Easter." "The Sparkle Egg teaches the doctrine of Grace and the freedom it brings from God's condemnation simply and elegantly. The empty Tomb is beautifully echoed in the empty Sparkle Egg. And we are left with a fullness of life. The Sparkle Egg will remind the mature Christian of his freedom and his joy. For the parent who desires to lead their children to the freedom Jesus brings, The Sparkle Egg is a moving and powerful tool."